DNC day 4: Clinton makes history by accepting Democratic nomination. The Democrats close out their convention in Philadelphia. (Image via the convention's Twitter account). Campaign veterans said this week that former Secretary of State Hillary Clinton would solidify her base, reach out to disenfranchised members of the middle class, and contrast herself with Donald Trump in her Thursday night acceptance speech. She did all three, making history as the first woman to win the nomination of a major political party. Questions remain about whether the address, and the Democratic convention itself, will unite the party after Clinton’s contentious primary battle with Sen. Bernie Sanders of Vermont. The closing night of the convention went big on patriotism and optimism in a way that mirrored Republican conventions of the past. It also featured a show-stopping moment when Khizr Khan, the father of a Muslim U.S. soldier killed in Iraq in 2004, pulled a copy of the Constitution from his pocket while criticizing Donald Trump and his proposed ban on Muslim immigration. Quick takes: Slate: Clinton speech "workmanlike, more of a series of bullet points than a story." Daily Beast: In historic moment, Clinton only delivers stump speech. New York: Democrats show their candidate is sane and competent. 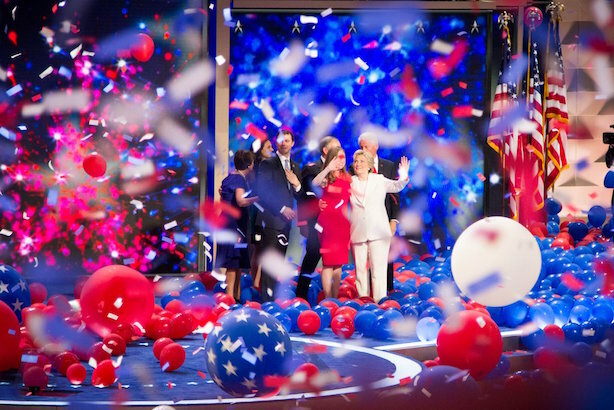 BBC News: Clinton’s speech soars — sometimes. APCO executive chair Margery Kraus’ memo to staff: "After working more than 50 years, often as the only women in the room, I can’t let this moment in history pass without comment. Tonight the United States has heard from Hillary Clinton, the first woman candidate for president from a major US political party. Irrespective of politics, you cannot ignore the significance of this long overdue but incredible milestone." Up next: Clinton, running mate Tim Kaine, and former President Bill Clinton will rally a crowd in Philadelphia at noon, then travel by bus to Harrisburg on first stops of trip through critical swing states Pennsylvania and Ohio. Trump in Iowa: The Republican nominee told a crowd in Davenport that he wanted to "hit a number of those speakers [at the DNC] so hard, their heads would spin…they’d never recover." Trump added that he "was going to hit one guy in particular, a very little guy," likely referring to former New York City Mayor Michael Bloomberg, who spoke at the DNC on Wednesday night.